Musicians custom embroidered cotton handkerchief. Musicians custom embroidered cotton handkerchief. 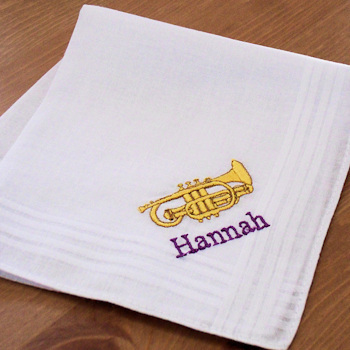 An cornet brass instrument embroidered handkerchief with personalised name or initials too. Select from a gift of one single hanky or set of 3 handkerchiefs. We can personalise the handkerchief with initials or a short name - in a thread colour of your choice. Choose a mans or ladies size handkerchief. Make a musicians day with this very attractive musical theme gift.